Barney Dean BVSc, PGDip(VCP), MRCVS. Barney graduated from the University of Liverpool in 2013. After spending 18-months working at a 100% small animal practice in Portsmouth, he moved back to his hometown of Bournemouth in order to undertake a rotating internship here at SCVS. This was followed by a year spent as a rotating intern at the University of Bristol’s Langford Small Animal Hospital while studying towards a postgraduate diploma. 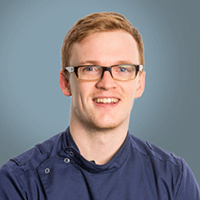 Barney then returned to SCVS in July 2017 to undertake a three-year residency in small animal surgery while studying towards the RCVS Certificate in Advanced Veterinary Practice and the ECVS Diploma in Small Animal Surgery. Dean B, Adamantos S (2017). In dogs with pyothorax does medical management alone, invasive medical management, or surgical management result in better long-term outcome? Veterinary Evidence Online; doi: http://dx.doi.org/10.18849/ve.v2i2.87. Matiasovic M, Halfacree Z, Moores A, Nelissen P, Woods S, Dean B, Chanoit G, Barnes D (2017). Surgical management of impalement injuries to the trunk of dogs: a multi-centre retrospective review. Doi: 10.1111/jsap.12767 [Epud ahead of print]. Dean B, Nicholson I, Tivers M (2017). Could patient-side Gram-staining improve antibiotic choice before culture and sensitivity results are available in small animal surgical cases with suspected surgical site infection? Oral abstract presentation at British Small Animal Veterinary Association Congress 2017, Birmingham, UK. Dean B, Witte P (2016). Biaxial minimally invasive plate osteosynthesis (MIPO) of comminuted supracondylar humeral fractures in cats. Poster presentation at 18th European Society of Veterinary Orthopaedics and Traumatology Congress 2016, London, UK. Dean B, Nicholson I (2016). Temporal bone partial ostectomy via the temporomandibular joint to treat osteosarcoma of the caudal zygoma in a three-year-old Labrador retriever. Veterinary Record Case Reports; 4: pp1-5.